The Haitian Revolution may have galvanized subjects of French empire in the Americas and Africa struggling to define freedom and 'Frenchness' for themselves, but Lorelle Semley reveals that this event was just one moment in a longer struggle of women and men of color for rights under the French colonial regime. Through political activism ranging from armed struggle to literary expression, these colonial subjects challenged and exploited promises in French Republican rhetoric that should have contradicted the continued use of slavery in the Americas and the introduction of exploitative labor in the colonization of Africa. They defined an alternative French citizenship, which recognized difference, particularly race, as part of a 'universal' French identity. 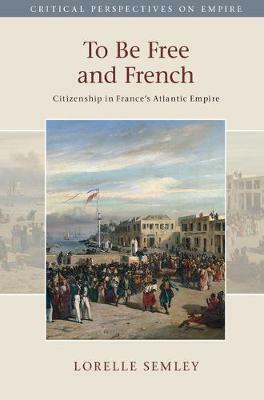 Spanning Atlantic port cities in Haiti, Senegal, Martinique, Benin, and France, this book is a major contribution to scholarship on citizenship, race, empire, and gender, and it sheds new light on debates around human rights and immigration in contemporary France.